Thanks for the post – very interesting as usual. Just love the cartoon. But I thought we already knew how safe home birth is – there’s been enough research done to confirm that it is safe. The other question I would ask is how one piece of research by itself can answer a question like this. I would argue that no one research project is perfect – there are always issues that will make that research give a less than perfect answer. EG the breech trial. This was going to be the research to end the queries of how to deliver breech babies but we all know what happened with that research. I’m not too sure what I’m trying to say here other than thank you for telling me about this ensuing research and I look forward to hearing all about it. It will give yet another perspective on home birth but I have my doubts as to how useful it will be considering medicine has been ignoring excellent research on home birth for years. And HAVE you seen the report on the care of a painful foot by a fat lazy male nurse? Sarah – I have real hopes for this as it is cross country, over a prolonged period and utilising CEMACH. The collaborative group is multidiscipliniary but to me there does seem to be a high proportion of midwifery orientated personel, I do think that medics may use this as an example of bias should they be unhappy with the results! DR C – I interpret the “She exudes a confidence that belies her relative inexperience, which perhaps goes some way to explaining why she is so suited to midwifery.” as saying that her confidence is a positive attribute in a midwife. I’m assuming that you feel that somehow inexperience, or the ability to bluff makes someone suited to midwifery! When I really consider that sentence it is impossible to determine what the author was trying to convey. With regard to my ‘goading’ comment, I’m just so paranoid that it seems to me that this was your intention. (You do seem to have an abhorance of midwives). ‘News from unscheduled care’. Well, little to say in his defence really, apart from he is an advanced practitioner so obviously has more medical knowledge than I do. In a similar situation in a midwifery scenario the lady would have have a full blood screen, including clotting, I would then have seen her the next day and, if the situation was still the same, she would have been assessed by an obstetrician who would have her blood results handy. I expect he’s really chuffed that you love his post. 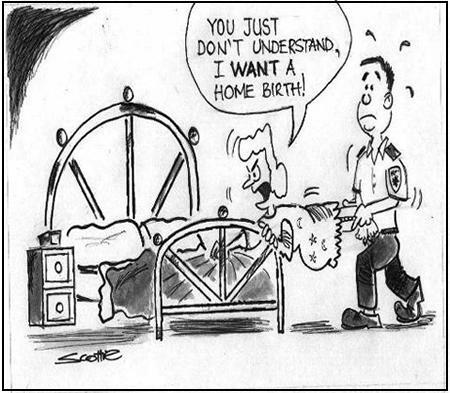 I don’t have strong views on home births or otherwise. I do wonder how it will be possible to have a study that manages to take out all the effects of high-risk pregnancies etc which is bound to skew things against hospitals (I would have thought anyway) – will they only pick women who are experiencing apparently normal pregnancies?? The only negative experiences I have had in terms of awful outcomes ie still births or neonatal deaths in the first few hours have been in hospitals but obviously there may hve been predisposing factors in some of those cases… The thing that would put me off home birth (not for me obviously as you know how medicalised I wanted my own births ;-)) are the rare but dreadful cases of placental abruption. We had one case shortly before Belle was born and she laboured beautifully and easily to about 7cm (in hospital) and then suddenly abrupted – they reckon it was less than 3 minutes from the abruption to knife to skin, the anaesthetist “happened” to be right there plus the obstetrician, the baby spent a week on SCBU and required transfusions but survived… I just couldn’t bring myself to face that (most minute I know) risk at home… Is it a question of knowing too much yet not well enough do you think? geepeemum – My understanding of the study is that it will only focus on those women classified as ‘low risk’ at the time that they go into labour. So they will have key areas of place of birth, obstetric unit, midwife-led alongside an obstetric unit, stand-alone midwife-led and home birth whose outcomes and they will compare and come up with how safe, how cost-effective and the women’s satisfaction. On this they will base the future of maternity care. As to the knowing too much, I’m not sure really. I worked for years in an obstetric unit before managing to ‘get out’ onto community so you would think that I would be as worried as you, but I’m not. Yes, things do go wrong at home births but it is extremely rare, I see things go wrong far more often in hospital to ‘low-risk’ women than I do at home and I think that helps me rationlise. I would be lying if I said that I don’t have a high adrenaline level at a home birth, I do. Having said that, one of my daughters had a home birth with me as second midwife. You would think that if I was ever going to suffer high anxiety it would be then but I have to say that it was a fantastic, calm, relaxed experience, my only worry was if the entonox would last! I was far more worried when my daughter had her twins by elective caesarian, I had seen too many unexpected traumas, to Mums and babies, to relax until at least 48 hours post-op. Ah but I think I’m still right. “Too much but not well enough” – you see my experience is too short and limited. I’ve NEVER seen a nice delivery except for 2 as a medical student. The other 2 I saw as a student – 1 ended up shoulder dystocia with lots of screaming, the other the baby died unexpectedly at 12 hours… And then I was either a paeds SHO or obs SHO and only got roped in for the horrid deliveries…. You may well know too much but you know enough and can therefore rationalise a lot better than me…..